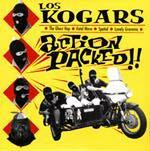 Los Kogars - Action Packed!! This is a very cool seven inch from Los Kogars. It's not exactly lo-fi, but it's certainly basic from a recording viewpoint. Nonetheless, the record stands up well. The Surfmen's "Ghost Hop" is done with lots of reverb and in true garage fashion. There are some really nice guitar moments here. Think of this as an honest cover. "Fatal Wave" is an original with some very nice guitar licks, particularly in the opening. It's not far off to say that this is the real thing. I like some of the guitar lines, and "Spatial" sports a fair number of changes. Rhythmic and cool in a slightly dark way. Somewhat on the low brow side, but more than that might imply. "Lonely Gremmie" seems kind of deliberate to me - perhaps lacking the kind of engaging enthusiasm Los Kogars usually have in their recordings.